When we build something, we build it to last! It’s horrible when people invest in something like a patio and it cracks only a year or two later. There are a lot of landscaping contractors that can can build something that looks nice, but they skimp on quality. 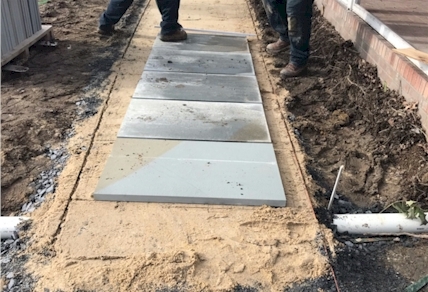 Here we are building a walkway for a happy customer – A compacted base, then sand, then blue stone. If you don’t build it correctly, a walkway like this will look terrible quickly. Have it done right the first time – Call F. A. Hobson Landscaping at 410-739-6800 and let’s get building!